The Verdict: The Bank of America® Cash Rewards credit card is an attractive everyday spending vehicle for people with excellent credit (Bank of America is a WalletHub partner). Things begin on a positive note, with no annual fee to worry about and the ability to earn a $200 initial bonus for spending just $1,000 in the first 90 days after account opening. The Bank of America® Cash Rewards credit card even supplements its base 1% cash-back earning rate with 2% back on groceries and wholesale clubs and 3% back on a category of your choosing. But there’s a catch. Those bonus earning rates apply to only the first $2,500 in combined grocery, wholesale clubs and gas purchases each quarter. So if you spend more than $833 a month on such everyday necessities, you will wind up hitting that limit and earning only 1% back — slightly less than the market average of 1.06% — on all your purchases for the rest of the quarter. For context, the average consumer spends about $1,650 in those two categories combined, per quarter, according to Bureau of Labor Statistics data. So if your spending is average or a bit heavier, the quarterly limit shouldn’t be a problem. As such, this card is a good option for moderate spenders who spend more on road trips, commuting and food for the family than the likes of airfare and hotel stays. You can learn more about why that’s the case below. $200 Initial Bonus For Online Applicants: The average consumer has more than $333 in credit-card eligible expenses each month. That means most qualified applicants will easily be able to meet the $1,000 threshold within the first 90 days of account opening and thereby claim their $200 prize. That’s effectively a discount of up to 20%, provided in the form of a statement credit. Up To 3% Cash Back: You will earn 3% cash back in a category of your choosing: gas, online shopping, dining, travel, drug stores, or home improvement/furnishings, and 2% at grocery stores and wholesale clubs - for the first $2,500 spent in those categories, collectively, every three months. That means this flashy feature is worth a maximum of $300 per year. Beyond that, you will earn slightly less than the rewards-card market average of 1.06% cash back, driving the average person’s first-year rewards earnings to $477, according to our calculations. The best part: Your rewards will never expire, unless your account is closed, in which case any unused portion will be forfeited by Bank of America. No Annual Fee: Many rewards cards charge annual fees to offset the cost of providing users with cash back, points and miles. Such cards can still pay off for high-volume, high-value spenders, but some people would rather avoid the pressure of having to make their card worthwhile. 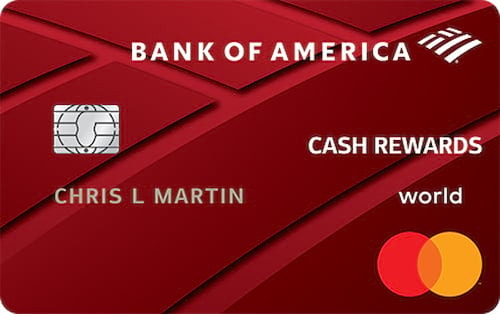 No-annual-fee rewards cards such as Bank of America Cash Rewards™ help you avoid playing from behind, so to speak, while giving you the option of not using your card if you so choose. Potential For A Very High Regular APR: You need excellent credit to get this card, but you may come to find that your interest rate is unbefitting of the term “excellent.” For a point of reference, the average credit card for people with excellent credit has a 14.41% APR, while the average “fair credit” credit card charges 22.57%, according to WalletHub’s latest Credit Card Landscape Report. That means you’re guaranteed to get an above-average rate for your credit rating, and it could even be higher than what a financially unproven applicant could expect to pay on the open market. 3% Foreign-Transaction Fee: The Bank of America Cash Rewards™ card is not a good travel companion for the simple reason that it will overcharge you on every purchase that you make, to the tune of 3%. That’s $150 on a $5,000 family vacation to Europe, for example. It also cuts your savings on currency conversion from 5.78% (relative to the average bank) to 2.78%.The same phenomenon also affects purchases made through internationally based merchants when you are physically in the U.S. So if you’re either a world traveler or a world consumer, you should probably find another card for related purchases. Rewards are perhaps the most popular aspect of credit-card use for consumers and, in turn, for issuers. Myriad attractive offers are available, with the value attainable from them near historic highs. There’s a lot of money riding on your decision, in other words. So in the interest of helping you make an informed selection, we compared Bank of America® Cash Rewards credit card to some of the other most popular cash-back offers on the market across five key categories. You can find the results below.